From CBS Sports … College football has been wrangled into the mud pit of college basketball’s corruption trial. And some of the biggest names in the sport were invoked Tuesday: Alabama, Notre Dame, Michigan and Penn State among others. Tuesday saw opening arguments and the introduction of witness testimony in the second of three scheduled trials the government has brought against key figures who are accused of fraud and bribery in college basketball. The two defendants in this trial, Christian Dawkins and Merl Code, were found guilty of multiple counts of fraud in the first college basketball case, which concluded in October 2018. The key witness now, in this trial, could prove to be Louis Martin Blazer, a self-made former financial advisor out of Pittsburgh who is a cooperating witness with the federal government. Blazer, 49, pleaded guilty to federal charges after the Securities and Exchange Commission and the U.S. Attorney’s Office accused him of misappropriating funds of NFL players whose accounts he managed from 2010-13. Blazer was in the position to financially advise NFL players because, per his testimony on Tuesday, he paid college football players at some of the biggest schools in the sport for more than a dozen years. His experience in that space led him to be the spark for the FBI’s investigation into college basketball. On Tuesday, Blazer testified under direct examination that he directed payments to football players from Alabama, Notre Dame, Michigan, Penn State, Pittsburgh, Northwestern and North Carolina between the years 2000 and up until 2013-14. From CBS Sports … As it does every year, the NCAA Playing Rules Oversight Panel approves adjustmentsto college football‘s rules in an attempt to improve the game. Of the items up for discussion this year, targeting (surprise, surprise) and overtime were two of the bigger-button issues on the table. The biggest complaint with the targeting rule is not necessarily the rule itself as much as the inconsistency with which it has been applied. There has been a well-documented trail of bad calls (see: Devin White vs. Mississippi State) and the inconsistencies between calls and penalties that can result in suspensions have taken away from the game. The goal of the targeting penalty is to change the way players tackle/hit one another for safety reasons. Empirically, that part seems to be working. However, it’s not supposed to a punishment for a bang-bang play, resulting in an ejection because someone looking at replay can’t say for sure it isn’t targeting. From CBS Sports … There have been a number of high profile undergraduate transfers who have received waivers to play immediately this offseason. In the future, though, waivers won’t be necessary in every single case. The NCAA Division I Council announced Friday that it has relaxed transfer rules for incoming freshmen athletes in certain situations, including those on teams that have made coaching changes. Incoming freshmen who enroll in summer school and receive financial aid can transfer and play immediately without a waiver if their coach leaves prior to the first day of fall classes. The rule only applies to those students who take their first semester of classes before the start of their first regular (non-summer) academic term, which means that it isn’t applicable to football early enrollees. Walk-ons who receive financial aid and non-recruited walk-ons can also leave without sitting out. The new rules go into effect for student-athletes who transfer to new schools this fall. From the Oregonian … Oregon Ducks athletic director Rob Mullens joined me for a discussion about the state of the Pac-12 Conference, Phil Knight’s support, the UO football program, and much more. From the Deseret News … Chayden Johnston joined the University of Utah football program after a standout kicking career at Bingham High School, but now he’ll be leaving the Utes after attempting just one kick in a college game. Johnston on Thursday announced via social media that he has decided to retire from football to focus on pursuing his career. The 6-foot-1, 160-pound Johnston was considered one of the better prospects in the country at kicker when he signed with Utah in 2015. After serving a mission for The Church of Jesus Christ of Latter-day Saints, he won the starting job in 2017 but missed his first attempt in the season opener. That opened the door for Matt Gay to take over, and Gay wound up winning the 2017 Lou Groza Award, given to the nation’s best kicker. Gay then had another excellent season in 2018, with Johnston compiling no statistics. Johnston’s departure leaves a significant void in a special teams unit that is perennially among the nation’s best, as walk-on freshman Jadon Redding is now the only kicker on the Ute roster. Freshman Ben Lennon of Australia will be assuming the punting duties. Do you have a sleeper pick for the Pac-12 divisions, either North or South? In the South, I predict chaos. Again. Always. Forever. Utah is well positioned to repeat as the Pac-12 South champ, but in the true spirit of Pac-12 After Dark, I will go out and say something totally (TOTALLY) bonkers. … So, maybe UCLA? Hear me out. The amount that team improved from game 1 to game 12 a season ago was impressive even though it was overshadowed by the whole nine-loss thing. But, the Bruin offense returns quarterback Dorian Thompson-Robinson, running back Joshua Kelley and four starting O-linemen as well as some great targets at receiver. The defense and special teams return most of their two deep. And with a full offseason of the Chip Kelly experience under their belts, I think this team comes into 2019 stronger. They also miss Oregon and Washington in the regular season and they get their two idle weeks before road trips to Stanford and Utah. And in a conference in which a five-win season really might get you to the title game, why not the Bruins? And in the North, I’d say Oregon, which isn’t a sleeper, but how great would a UCLA-Oregon Pac-12 title game be? We could call it “A Tale of Two Chippies” … there’s a reason they don’t have me headline stories at The Athletic. But I will say that I think the Ducks’ are going to surprise some people with how they win. That offense is going to be able to score points. And even though Oregon has a new defensive coordinator in Andy Avalos, I have confidence that he’ll be able to thrive without Jalen Jelks/Justin Hollins/Ugo Amadi. Last season at Boise State, Avalos pulled off one of the more impressive coaching jobs as the Broncos suffered injury after injury to key players. He moved guys around and put others in positions to succeed and the unit finished the year as a top-30 scoring defense. From The Athletic … Lynn​ Swann sat​ in his second-story office​ within Heritage Hall​ on​ Thursday, five days​ removed from​ the​​ three-year anniversary of his hire as USC’s athletic director. Within his first two years on the job, USC won a Rose Bowl and a Pac-12 title in football and the men’s basketball team made an NCAA Tournament appearance. However, this academic year has placed Swann, the pro football Hall of Famer and Trojan legend who is also a first-time athletic director, under scrutiny and in the midst of a storm. The football and men’s basketball programs both finished below .500 for the first time since 1983-84, and Donna Heinel became the second member of the athletic department to be involved in a federal investigation since Sept. 2017. This is without mentioning the criticism he’s received for his decision to retain Clay Helton. What’s your feeling about the state of the football and basketball programs right now and the struggles they had this year? I think you can pick them apart, look at them and say, “These are the reasons why they are where they are.” I think both programs are on solid ground. I think our basketball program, unfortunately, last year with the number of injuries, there were times you didn’t have 10 people you could practice with. It was unfortunate. If you look at their season, look at the way they played in the Pac-12 championship, they still got better. They still improved. They could have won and beaten Washington. You look at the Pac-12 championship and Oregon wins it, look how deep Oregon went into the (NCAA Tournament). That could have been USC. So there is reason to be optimistic about basketball and where they’re going. I think when (head coach) Andy (Enfield) was hired, he was hired to bring stability to a program and to move it up. And I think he’s doing that. You look at his recruiting class coming in and so forth, there are lots of things to be very positive about so we’ll see what happens in 2019-20 season. Football, it was a bad season. But there are a lot of things that go into what happens in a football season, why a coach is there, the decision to retain and keep Clay was not made in a vacuum. I believe Clay has the ability to be a very good head coach and so my decision was made on a variety of parameters and a variety of issues. So he’s here. I think if you look at his recruiting classes, he’s done well with the recruiting classes. His team will be able to compete. He has a staff he’s put together, a staff he’s comfortable with. We’ve had a good spring and he feels very good about the spring. So 2019, with the opening of the Coliseum, kind of a remodeled stadium, we’ll see how we perform. What do you feel the morale of the USC fan base is right now considering the 5-7 season in football, the struggles in basketball, the admissions scandal? I think our fan base, they’re obviously disappointed and who wouldn’t be? But we seek to change that and improve that. People who came out and watched our spring practice, I think they saw improvement, a renewed enthusiasm. I think they probably saw, in terms of the coaching staff and what they were doing, a sense of urgency in implementing a new system, getting people ready and prepared. So I think there are some positives from that standpoint. If you look at basketball and you look at the recruits who signed national letters of intent, I think you’re seeing talent come into this program and there’s going to be some great opportunities. It’s not that it’s going to be that easy. It’s not that the rules and things around us are making it easy. When you look at the number of kids who have signed up in the NCAA portal to transfer in football — I think over 2,000 kids are in the portal, maybe 2,500. Women’s basketball, there are 500 women in the portal. Over 900, maybe close to 1,000 in the portal. So there are adjustments for everybody to make along the way. From the San Jose Mercury News … Oregon has Phil Knight. Stanford has John Arrillaga. UCLA has Casey Wasserman and Mo Ostin. Arizona has the Davis and Stevens families. And now Utah has the family of Ken Garff. The Utes have done well to contend in the Pac-12 with a stadium in need of renovation, but that wasn’t a realistic long-term existence. Upgrading Rice-Eccles Stadium was essential. Former athletic director Chris Hill knew it, current athletic director Mark Harlan knows it, and Kyle Whittingham sure as heck knows it. But Utah being Utah, fiscal sanity was required for the $80 million endeavor to unfold sooner than later. That took the form of a capital plan by which private donations had to account for approximately 45 percent of the funding. In other words, the Utes needed $35 million in donations to get clearance for the remaining $45 million, which will come from bonded debt (and other sources). Garff, who owed dozens of car dealerships, passed away two decades ago. His family came forward recently to pledge $17.5 million to the Rice-Eccles project, ensuring the Utes would hit their private funding goal. The project will unfold between the 2020-21 seasons and include a small capacity increase, more premium seats, new lockerrooms, new concourses — everything required to 1) help recruiting 2) improve the fan experience and 3) generate new revenue streams (via the premium seats). The development in Salt Lake City is critical not only for the Utes but the entire Pac-12. Each athletic department must pull its weight (relative to resources) in order for the conference to thrive. Looking across the South, we see USC renovating the Coliseum, UCLA opening a slew of facilities on campus, Arizona State renovating Sun Devil Stadium, Arizona unveiling an indoor practice facility and Colorado just a few years removed from opening its new football complex. It’s all exactly what the conference needs, and yet the process never ends. From ESPN … Let’s start with the most outrageous number: According to ESPN’s Playoff Predictor, the Tigers have an 83 percent chance to reach the playoff. Though they lost some imposing defensive talent in their front seven, the reigning champs have stability at head coach and a superstar talent returning at quarterback in Trevor Lawrence — both key factors in earning the confidence of ESPN’s Football Power Index. And though FPI had Clemson as the top team at this time last year, it thinks this season’s squad is almost four points per game better than what it thought of Dabo Swinney’s team 12 months ago. 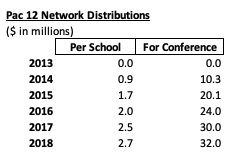 Add in the fact that the Tigers’ schedule rates as only the 56th-hardest among FBS teams, and it’s just hard to fathom how Clemson could not make the committee’s top four come Selection Day. We’ll hazard a guess that over the next decade, no team will have a higher preseason chance to reach the playoff — per our model — than Clemson has right now. … The Pac-12’s two-year playoff drought is in good shape to continue: Our projections give the conference just a 21 percent chance to put a team in the playoff in 2019. The conference’s issue: It has plenty of good teams but no great teams. The Pac-12 boasts eight teams between Nos. 10 and 36 in FPI’s rankings — but none better than Oregon, at No. 10. With so many teams in the same ballpark, it makes it more difficult to end up with a zero- or one-loss conference champion — generally (but not always) the recipe for a Power 5 conference to put a team into the playoff. From CBS Sports … The top 100 football-playing universities have to consolidate their athletic media rights to maximize their worth in the future, a powerful Oregon official told CBS Sports. “Why? Because there’s [not enough] money for athletics,” Pat Kilkenny said recently. Kilkenny is a former Oregon athletic director who now consults for multiple schools and is a longtime confidant of Nike CEO Phil Knight. After Fox declined its option, ESPN took over the rights to three future Big 12 football championship games. It also acquired the rights to hundreds of contests across all sports, which will be moved to ESPN+, the cable network’s growing pay streaming platform. “It’s going to be a huge addition for recruiting, a huge thing for anybody that wants more,” commissioner Bob Bowlsby said. From the San Jose Mercury News … What we saw Monday night — Virginia raising the trophy — we could see again a year from now. As of this moment, the Cavaliers are the team to beat in 2020. From CBS Sports … With Virginia’s 85-77 victory over Texas Tech in the NCAA Tournament championship game, the 2018-19 college basketball season was completed. So now it’s time to look ahead to the 2019-20 season. And, if these projections prove correct, next season will be all sorts of fun for fans in the state of Michigan because, I think, Michigan State and Michigan should both be great. They are No. 1 and No. 2 in the preseason Top 25 And 1. And before you scream “but it’s too early to rank teams for next season because we aren’t even sure who’s coming and going,” understand that I did this exact exercise on the night of the 2018 title game, and 14 of the 16 schools that ultimately made the Sweet 16 of the 2019 NCAA Tournament were in my initial Top 25 And 1. So, at least last year, these rankings were a nice preview of the season to come. From ESPN … The 2018-19 college basketball season officially ended Monday, with Virginia beating Texas Tech 85-77 in overtime. That means it’s already time to look ahead to next season. From Sports Illustrated … Way-too-early is an understatement—there might as well still be confetti on the court in Minneapolis—but with another college basketball season all wrapped up, it’s a good time to look ahead to the fall, if ever-so-briefly. These rankings are going to look way different come October, noting the impending flurry of movement (between NBA draft decisions, coaching changes, grad transfers and uncommitted recruits, there’s a lot left to happen). Think of this less as a personal affront to your school, and more of a cursory look at the field. From the San Jose Mercury News … Pac-12 Networks president Mark Shuken chatted with the Hotline last month in Las Vegas about a range of topics directly and indirectly related to the networks’ future. From ESPN … NCAA president Mark Emmert says a judge’s recent ruling in a federal antitrust lawsuit reinforced that college athletes should be treated as students, not employees. Emmert spoke to The Associated Press on Wednesday at U.S. Bank Stadium, the site of the men’s basketball Final Four, and made his first public comments since last month’s decision in the so-called Alston case. … Even though Wilken’s ruling fell well short of that, plaintiffs’ attorneys have celebrated it. They called it another step toward unraveling the NCAA’s definition of amateurism, which they consider unjust and arbitrary. In 2014, Wilken ruled against the NCAA in an antitrust lawsuit brought by former UCLA basketball star Ed O’Bannon. He claimed the NCAA and conferences inappropriately used the names, images and likenesses of college athletes without compensation. From USA Today … The Pac-12 ended last season with two ranked teams: Washington and rival Washington State. That’s fewer ranked teams than the Mountain West, which had three. Likewise with the SEC West — and the SEC East. The Big Ten finished with five ranked teams, three in the East. While the ACC matched the Pac-12 with just two teams ranked in the final polls, there’s one significant difference: Clemson. The Tigers tore through league play, the national semifinals and then Alabama. The Pac-12 was essentially removed from the College Football Playoff discussion after Washington’s loss to Oregon in October, even if the Cougars remained on the very periphery of the race heading into the final weekend of the regular season. It’s springtime in the Pac-12. One question stands above the rest: Can this league put a team into the semifinals, or will it once again be left out of the conversation before even the debut rankings? The Huskies are the offseason favorite with several others in tow as the Pac-12 heads into April. New coach Mel Tucker brings a solid defensive reputation to his new job, making that side of the ball the primary topic of offseason conversation. Yet it’s the offense that’s intriguing, especially given the question of how well senior quarterback Steven Montez fits into a scheme that seemingly asks its starter to threaten defenses with his legs. From YardBarker … The USC athletic program is in a state of disarray, and many fans are calling for athletic director Lynn Swann to either be fired or step down because of it. If the way he spent his time over the weekend is any indication, Swann is not bothered by that talk. As Patrick Hruby of the Los Angeles Times noted, Swann was one of more than a dozen sports personalities and celebrities who attended a memorabilia show in Washington, D.C., over the weekend. He signed autographs for fans and collectors who paid $220 and up for his signature. Meanwhile, USC trustees and senior leaders were meeting in Santa Barbara to discuss some of the many issues surrounding the school, which include the Trojans’ involvement in a recent FBI investigation into college basketball as well as the admissions scandal that has rocked the school. A university spokesperson told Hruby that Swann was invited to the event but was not required to attend, as there was nothing on the agenda that directly related to him. That doesn’t make the optics any better. USC is facing some of the most significant issues in school history, and the athletic director is out profiting from an autograph signing. Former USC linebacker Ricki Ellison, who won a co-national championship with the Trojans in 1978, was in disbelief. “Lynn’s a good guy, but isn’t his salary in the millions?” Ellison asked. “Why does he need to do this? It’s just embarrassing. USC’s football team has taken some major hits in recent months, and Swann should at least be giving off the impression that he is doing everything in his power to fix it. It’s hard for him to make that case when he’s smiling and collecting money from fans while signing photos of himself. From ESPN … United Airlines offered Friday to withdraw from a $69 million deal to change Los Angeles Memorial Coliseum to United Airlines Memorial Coliseum following criticism that adding a corporate name is disrespectful to the facility’s history of honoring troops who fought and died in World War I. From The Athletic … At​ the end​ of the first meeting​ of Washington State’s​ Insurgent​ Warfare and Football​ Strategy class​ a Q&A session​​ opened up. There were a few general questions, and then one student near the front of the class raised his hand and directed one toward co-teacher — and, also, head football coach — Mike Leach about the future of football, specifically regarding artificial intelligence. He strings together thoughts, jumping from one topic to the next with a thread that few might follow and many might chalk up to eccentricity, but in his head, it all makes sense. And so, with the class — slotted to last an hour and a half — looking to end right on time, it’s understandable that those in attendance who knew Leach well sighed when the question about artificial intelligence and football came up. From the San Jose Mercury News … The decade is over for Pac-12 men’s basketball (as defined by the NCAA records book), and it was a forgettable one, indeed. 1. What constitutes a good season for the Pac-12? 2. What will it take for the Pac-12 to regain national respect? 3. What will it take for Pac-12 fans to stop declaring that the sky is falling? Starting and ending the season on high notes while avoiding PR drama in the middle. The Pac-12 needs to show up in its marquee non-conference games this year: Early on, Stanford has Northwestern and UCF, Washington State has Houston, Oregon has Auburn, Colorado faces Nebraska, Arizona State has Michigan State, and Arizona has Texas Tech. The Pac-12 needs to win a majority of those games and, ideally, in convincing fashion. Then, the season needs to be defined by the football, not by off-field or HQ drama. Come bowl season, another playoff absence would just add to the narrative that the Pac-12 is falling further and further. So, a playoff appearance plus some convincing bowl wins would go a long way. Is that too much to ask? At this point, I honestly don’t know. With regard to national respect, consistently making the playoff and convincing West Coast talent to stay in the West is crucial. Produce a playoff team most years and the conference will be fine on the national stage. Plus, being a part of that conversation on TV networks and in major publications is great for recruiting and would figure to help attract more talent. And finally, the sky-is-falling crowd is always going to be there. We are all Chicken Littles just trying to get through the season. Everyone is always going to think that the worst thing is just around the corner. But hey, it’s kind of fun to live on that edge, right? How patient are Buff fans going to be with Mel Tucker? Are they in a kind of a “Year Zero” situation? Every coaching transition takes time. The energy and enthusiasm in Boulder are genuine, and I do believe there’s an intensity the team is playing with that maybe hasn’t been there consistently. But, Colorado has serious gaps to fill at linebacker, safety and running back, and though the passing game returns talent in Steven Montez, Laviska Shenault and K.D. Nixon, they’re also all adjusting to a new system. I say this every time there’s a coaching change, because fans want to put a bar down at the beginning of the season and say that one side is success and one side is failure. It just doesn’t work like that. I think Colorado fans need to see how the offensive execution improves from week 1 to week 4. I think they should look at how the team is playing in the fourth quarter when the score is unbalanced (with the Buffs being up a lot or down a lot). I think they should see what the morale of the team looks like if the group loses a few games in a row and how maybe that’s different than it was in seasons past. I know that’s not what fans want to hear because how can you measure any of that? And, sorry, you can’t. But success in year 1 looks so different at every single program. Every new beginning is hard. So, look for growth and change.